Have you seen the new colorful iMac series that were released in MacWorld EXPO? They are cooool and I want them very much! 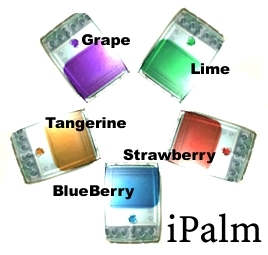 If Steve Jobs has made Palm, you would have get the following ones. the picture of the real PalmIII that exsits in Japan. Its name is 'iPalm' that Mr.Sharming made. You can see it in the Palm/Pilot Museum. that the pictures of your remodeled Palm/Pilots are displayed. you should send the picture of it to here?